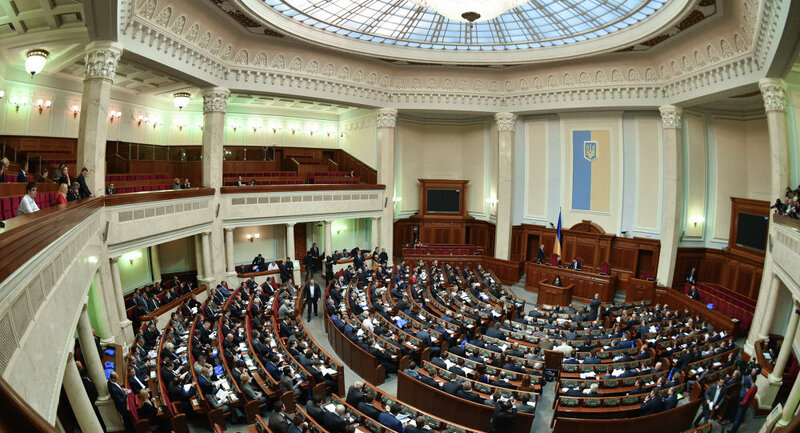 KIEV (Sputnik) — Ukraine's parliament, the Verkhovna Rada, approved President Petro Poroshenko's proposed constitutional amendments on decentralization Monday. The document was supported by 265 lawmakers, with the necessary minimum of 226. The bill will be considered in the Tuesday's parliamentary session. The law must receive the backing of at least 300 votes in its second reading. Representatives of the Ukraine's Radical Party tried to sabotage the reading of the document, chanting "Shame!" and disrupting lawmakers' speeches. In keeping with the provisions of the Minsk accords, reached in February 2015, President Poroshenko agreed to grant a special status to the self-proclaimed Donetsk and Lugansk People’s Republics. Minsk deal describes decentralization of particular districts of Donetsk and Lugansk regions and their special status as the key elements of the proposed constitutional reform in Ukraine. On August 24, Petro Poroshenko said that the proposed constitutional reforms had ruled out any federalization or other special statuses for any part of Ukraine.